Today is part of Queer Town Abbey’s Is it summer yet? blog hop in which participating blogs are singing the joys of warm weather and flowers and butterflies. Or if you’re me, wondering which summer memory to share. Because as with most people, my looking back brings up a haze of memories where everything runs into the next image, and I can’t tell if the summer in which I learned to float in the sea (I called it swimming and who is to gainsay me?) is the same summer that my swimming cossie was this darling pale green affair with masses and masses of shirring elastic—it had an odd bubbly effect on the fabric that I remember thinking was terribly chic—and the same summer where I earned sixpence with the beach ponies or spent hours in the barn using the pile of grain for a slide or had toffee apples where the toffee was a brilliant, clear scarlet that no ruby has ever been able to match. I don’t think that it’s necessarily that as I’ve got older, my memory has started to fail me. For one thing, it was always pretty shite. But for another, I think it’s more in the nature of summers when you’re a child, for them to merge and coalesce into that indistinguishable haze that reminds me of Golden Syrup slowly, slowly, slowly falling from a spoon in a long amber drop: clear, golden, sweet, rich, endless. When I was a child, my parents were rather poor. There was never any question of us having a ‘paid for’ holiday. Instead, summers were spent with my grandparents. 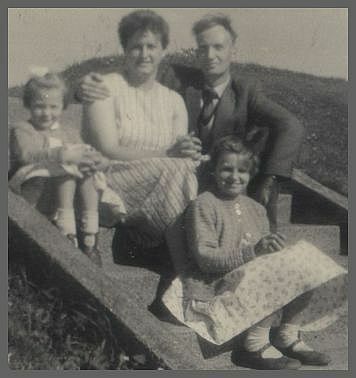 Dad’s mum lived on the coast, at South Shields. Most of his family still does, two or three generations on. It’s a funny sort of resort, probably popular back in the 1920s and never really getting over the Great Depression. But the beach was great for learning to float/swim and why it’s a bad idea to touch jelly fish (they are *squidgy*, for a start). I loved horses as a girl. I know. Every prepubescent girl does. There was never any chance I could ever own a pony or even ride one often, except at the beach. A man had a string of ponies, ten or twelve, maybe, and people paid sixpence to climb up and have a little ride down to Marsden Rock and back, the ponies led by an urchin. And me. For one entire day, I laboured at taking a pony on that little circular trek, always with someone else in the saddle. My pony that day was a tough little Welsh cob, a bay. I walked him up and down that beach for hours. And at the end of the day, when everyone was packing up and going home, I was paid. A sixpence. A lovely, shiny silver sixpence. Which I promptly handed back over to the pony man in exchange for a ride down to the Rock on that pony. I had my priorities, you see. Even then. To get to another participant’s blog, follow the link back to Queer Town Abbey. Get your chance to win prizes, including an iPod Shuffle— check out the Rafflecopter on QTA’s page and enter the Grand Prize Giveaway. Comments left here on this post will enter you in a giveaway for my completely unsummery novella, FlashWired. They’re in space, you see, so sadly, seasons are irrelevant to them. Leave your email address in your comment if you’d like to enter the giveaway. When the blog hop ends, I’ll stick a pin in the list of names to choose one, and send you the ebook. Have a wonderful summer, when it gets here at last. Hope you enjoy it all. I’ve read some darn good blogs today. But for another, I think it’s more in the nature of summers when you’re a child, for them to merge and coalesce into that indistinguishable haze that reminds me of Golden Syrup slowly, slowly, slowly falling from a spoon in a long amber drop: clear, golden, sweet, rich, endless. You flatter me on that, you know! Grins at you. I was going to leave a comment, but then read Sarah’s and it was almost word-for-word what I would have said. So my comment is reduced to the rather inelegant “ditto”. I also enjoyed reading your adventures in ponyland, – I would have done precisely as you did! Ooh, space boys–good any time of year! Thank you for sharing your story & Thank you for having this giveaway!! And you, Brandi. Enjoy the rest of the blog hop. Leslie, my lovely husband just drew your name out of a hat (well, a clean cereal bowl to be precise!) and I’ll be happy to send you a copy of FlashWired – I have it as Kindle format, ePub, pdf or mhtml. Please let me know which one you’d prefer and I’ll send it along. We never went on the beach where the donkeys were but I think I would have loved to have a ride. We’ve moved to the coast and in the summer you can hear the donkeys braying in a field near by. It was one of the delights of my childhood, donkey and pony rides on the beach. At least you can go and pat a donkey now! They’re very sweet little things. I saw that pony about three years running, I believe. I’ve been trying to remember his name – which was picked out in little metal studs across his nose band – but to no avail. Sigh. Old age and a bad memory aren’t helping me there! Thank you for sharing your memories, worlds away from growing up in Florida in the late 60’s – mid 70’s. Heavens yes! You would have *far* better weather!! The coast of NE England can be a stark place, often, and the North Sea is chilly! 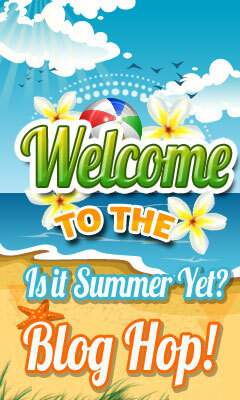 I want to send a personal thank you for your participation in the Is It Summer Yet? Blog Hop. Thanks to you the Blog Hop was a great success. I would like to take this opportunity to wish you a happy and safe summer. Thank you, Anders. It was great fun to do. Thanks for organising it. Grins at you. Thank you! I’m glad you enjoyed the post.